Live the essence of romantic Italy in the iconic lovers places: the eternal city of Rome, the aristocratic Florence, with its art treasures and elegant Made in Italy shops, and the ever-romantic city of Venice, with its unique architecture. 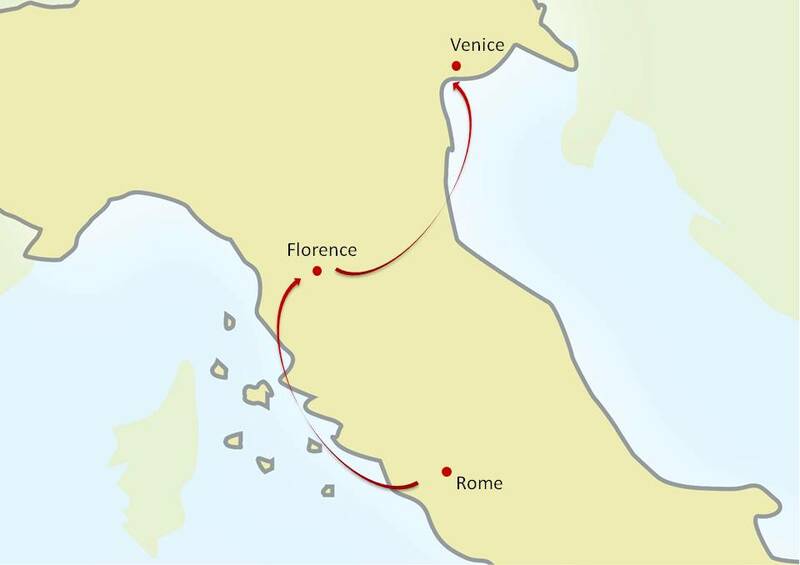 The tour features Rome, Florence, Siena, San Gimignano, Chianti, Verona, Venice. You can customize. START HERE. 9 Nights accommodation in exclusive and fascinating 4/5 stars Small Luxury Hotels with full buffet breakfasts: 3 Nights in Rome, 3 Nights in Florence, 3 Nights in Venice. Welcome Honeymoon Package at your arrival in each hotel. Selected typical Italian meals: 1 Lunch in Verona, Lunch and wine tastings in Chianti countryside, Farewell Dinner at an exclusive refined restaurant in Venice. Private sightseeing walking Tours with expert local English speaking Guides, including all the entrance fees to the sites visited, with preferential skip the line access: Rome (Colosseum, Roman Forum, Imperial Fora) – Florence (Accademia) – Venice – Siena – Verona. 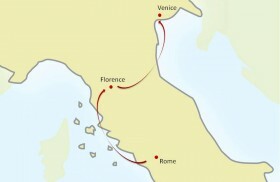 Private Tours in St. Peters and Vatican Museums (Rome), Uffizi Gallery (Florence) and an exclusive “Hidden Venice Tour”. Boat Tour of the three main island of the Venetian Lagoon: Murano, Burano and Torcello. Unique special activity for you two: romantic Gondola Tour in Venice. Full Day Excursion with private Chauffeur-Guide in Chianti countryside. High Speed Trains: Rome – Florence – Venice – Verona: 1st class tickets and seats reservation. All private transfers with deluxe van with English speaking driver for transfers and excursions for the entire Tour (including airport/train stations transfers). Our professional assistance for the whole duration of the Tour. Tour begins in Rome and ends in Venice. Tour begins in Rome. 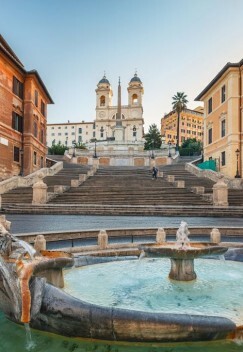 Walking Tour with your private guide through the Ancient Rome highlights: Aventino Hill with its famous keyhole, Palatino Hills and Circus Maximus. Entrance tickets for the Colosseum and Imperial Fora. Great private guided Tour of Vatican Museums and St Peter’s Basilica. Discover the “Italian genius in Florence” with a private walking tour admiring the Italian renaissance art. Private guided Tour in the Accademia Gallery and the Uffizi Gallery. See the works of the greatest artists from the Middle Ages to the Renaissance. Get fascinated with the stories of the characters and protagonists of this city. Full Day in Chianti. Visit the only one city that in ancient time can competed against Florence for power, wealth and artistic beauties: Siena. Lunch and wine tastings in San Gimignano, recognized UNESCO World Heritage Site for the uniqueness of its landscape and famous for its wineries. Private Tour of classic and hidden Venice, from San Marco square to Ponte di Rialto bridge: the essence of Venice. Private gondola Tour through the narrow channels. Boat Tour of the three main island of the Venetian Lagoon: Murano, Burano and Torcello. Special Tour to the Shakespearian places in Verona, following the historical references to Romeo and Juliet’s story, the Arena and many other beautiful monuments of the town. Typical Lunch in Verona. Farewell Dinner in a tiny and refined restaurant. LIKE THIS ITALY HONEYMOON? You can customize. START HERE. The difficulty in organizing tours in Italy is finding the right information to create an itinerary that provides you an enriching travel experience. Planning a trip to Italy can be very complex and the rhythm of modern life doesn’t always allow enough time to organize such a trip. Being Italians and based in Italy, we assist you with Italy tours that are anything but ordinary. We show you the "real Italy". Not only through the sites, art and history but more importantly through the Italian people and their traditions: the Italy of the Italian people. With frequent departures and variable lengths of stay from eight to twenty days and even more, we are equipped to offer you the type of holiday you desire. Fuoritinerario – Discover Your Italy Small Group tours allow a more intimate encounter with the country and are typically a mix of travelers: friends travelling together, couples, all of varying ages, backgrounds and nationalities. Come prepared to make plenty of new friends. That will make your travel experience in Italy much more interesting, valuable and unforgettable. Often travelers prefer the option of private travel with their own companions and departure date. Fuoritinerario – Discover Your Italy makes the process of planning a private Italy tour easy: designing the itinerary from scratch, booking the most charming hotels, selecting the best guides and negotiating the right rates for all services. Tours tailored to fit your expectations with the guarantee of individuality and style in every detail. Designed to make your travel experience unforgettable so that you take home long lasting memories of “your Italy".